a weapon of mass destruction being used everywhere in the world for population reduction. HAARP was intended to be a method of warfare, avoiding bullets and bombs, where nations could be eliminated by degrees destroying their agricultural output and their environmental basis of life. of the world unable to survive. 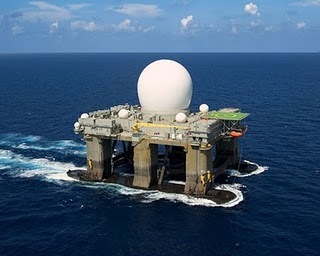 Once the DUMBs (Deep Underground Military Bases) have been knocked out, the 'White Hats', spoken of by Benjamin Fulford, should deploy their forces to destroy the world's HAARP installations, all 14 on the map, before they destroy us. Gordon Logan believes the world's HAARP capability will be deployed to eliminate the magnetosphere just at the moment the sun is emitting its most powerful flares. This event is predicted for the Spring of 2013. The world's electrical installations will be knocked out apart from those deep underground - in the DUMBs where the elites intend to survive and later emerge unscathed to roam over a planet emptied of humans, apart from the few who can survive on the earth's surface without energy and transportation. The war is happening now. Not between countries and nations, but between the mass of humanity, who are unaware of what is happening, and the elites who are rushing to end their existence, before they realize what is happening. In the meantime nuclear accidents are being allowed to poison vast portions of the globe. Presumably the elites have the technology to clean up the environment once the cesium has done its work. Unless, of course, they have simply gone stark raving mad. See HAARP3 for the graph of Haarp activity taken before, during and after the Japanese earthquake. for interesting factual data for those implications. get on this issue, which is full of illegible rants from the conspiracy circuit. Well worth the 50 min watch. Mind control for the masses? Shield against incoming missiles from Russia and UFO's?  See http://www.brojon.org/frontpage/bj1203.html which contains many other links also. Was HAARP used experimentally to bring the spaceshuttle Columbia down? HAARP (High-Frequency Active Auroral Research Program) is a high-powered radio transmission research facility in Alaska jointly operated by the US Navy, Air Force and several universities; a BIG particle gun. What is it used for; or WILL it be used for? That's the big question. 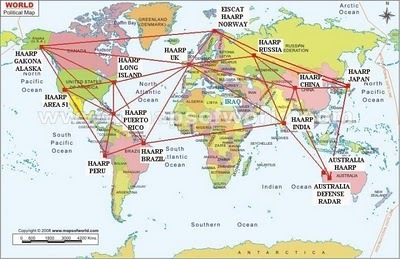 What is the REAL purpose of HAARP??? "GWEN is a superb system, in combination with cyclotron resonance, for producing behavioural alterations in the civilian population. The average strength of the steady geomagnetic field varies from place to place across the United States. Therefore, if one wished to resonate a specific ion in living things in a specific locality, one would require a specific frequency for that location. The spacing of GWEN transmitters 200 miles apart across the United States would allow such specific frequencies to be 'tailored' to the geomagnetic-field strength in each GWEN area." - Robert O. Becker, M.D., in "Crosscurrents: The Perils of Electropollution"
In Presidential Decision Directive (PDD) NSTC-6 of March 28, 1996, the President designated the Department of Transportation as the "lead agency for all Federal civil GPS matters." In addition, the President directed the USDOT to "develop and implement U.S. Government augmentations to the basic GPS for transportation applications." In January 1997 the USDOT formed an interagency DGPS Executive Steering Group and a DGPS Policy and Implementation Team to investigate the development of a nationwide differential service to comply with Presidential direction. The findings of the Executive Steering Group determined that building upon existing infrastructure and resources - Coast Guard Maritime Differential Global Positioning System (DGPS) sites and conversion of existing US Air Force Ground Wave Emergency Network (GWEN) sites - was the most practical method available to adequately fulfill the PDD and meet the user agency operational and technical needs. Section 346 of Public Law 105-66, dated October 27, 1997, (Attachment A) grants authority to the USDOT to "take receipt of such equipment and sites of the Ground Wave Emergency Network ... as ... necessary for the establishment of a nationwide system to be known as the 'Nationwide Differential Global Positioning System .'" The Ground-Wave Emergency Network (GWEN) is a communications system that the military is in the process of constructing as we speak. It operates in the very-low-frequency (VLF) range, with transmissions between 150 and 175 kHz. This range was selected because its signals travel by means of waves that have a tendency to hug the ground rather than by radiating into the atmosphere. This signal drops off sharply with distance - a single GWEN stations transmits in a 360 circle to a distance of 250 to 300 miles. The entire GWEN system consists of approximately 300 such stations spread across the United States, each with a tower 300-500 feet high. The stations are from 200 to 250 miles apart, so that a signal can go from coast to coast from one station to another. When the system is completed around 1993, the entire civilian population of the United States will be exposed to the GWEN Transmissions. According to a 1982 Air Force review of biotechnology, ELF has a number of potential military uses, including "dealing with terrorist groups, crowd control, controlling breaches of security at military installations, and antipersonnel techniques in tactical warfare." Each site would consist of a 299 foot tower (presumably to get around automatic imposition of the National Environmental Policy Act requirement for an environmental impact statement for any federally-funded 300 foot tower), a concrete building, and a series of fences on a 700 foot square site. Underground, a "ground screen" of copper wire would radiate to 330 feet at regular intervals. Physically unimpressive, the towers are presented to the public by the Air Force as radio towers for "emergency communications." The whole damn dumb show was supposed to go down in late 99, but they didn't get people's guns, that big final obstacle to fascism. That's when they hit upon these ELF towers. Tested them in Ventura, Africa, and the Sudan. They had GWEN operational in '92, but it did entire counties and would affect their own people, who have body suits they were (lined with lead-impregnated kevlar- which blocks elf and piggyback freqs.). Now...how can you fire a gun or load it, if you are crawling on the ground begging for mercy? If you can imagine the worst abdominable pain there is, then you know how debiliating it is - you simply can't do anything, but lie on the ground and pray for relief [Editor's Note: this assertion has been corroborated by Al Bielek, Stewart Swerdlow, Col. Fletcher Prouty, and even Major Ed Dames. During the 1991 Gulf War, hundreds of thousands of Iraqi troops spontaneously surrendered without even attempting to fight. It was this very ELF mind control technology which had been applied and rendered them impotent... Ken Adachi]. The French pioneered this technology in the late 70s from Bell Labs. They created a device for crowd control that looks like a big baseball stadium loudspeaker. It fits into the back of a van. Then they'd open the doors, pointing the van at the crowd. I've seen the device. The following document comprises evidence for a lawsuit filed at the US Courthouse in Washington, DC, by John St. Clair Akwei against the National Security Agency, Ft George G. Meade, Maryland (Civil Action 92-0449), and constitutes his knowledge of the NSA's structure, national security activities, proprietary technologies and covert operations to monitor individual citizens. Blanket coverage of all electronic communications in the US and the world to ensure national security. The NSA at Ft Meade, Maryland has had the most advanced computers in the world since the early 1960s. NSA technology is developed and implemented in secret from private corporations, academia and the general public. The Signals Intelligence mission of the NSA has evolved into a program of decoding EMF waves in the environment for wirelessly tapping into computers and tracking persons with the electrical currents in their bodies. Signals Intelligence is based on the fact that everything in the environment with an electric current in it has a magnetic flux around it which gives off EMF waves. The NSA/DoD [Department of Defense] has developed proprietary advanced digital equipment which can remotely analyze all objects whether manmade or organic, that have electrical activity. The NSA has records on all US citizens. The NSA gathers information on US citizen who might be of interest to any of the over 50,000 NSA agents (HUMINT). These agents are authorized by executive order to spy on anyone. The NSA has a permanent national security anti-terrorist surveillance network in place. This surveillance network is completely disguised and hidden from the public. Tracking individuals in the US is easily and cost-effectively implemented with the NSA's electronic surveillance network. This network (DOMINT) covers the entire US. involves tens of thousands of NSA personnel, and tracks millions of persons simultaneously. Cost-effective implementation of operations is assured by NSA computer technology designed to minimize operations costs. NSA personnel serve in quasi-public positions in their communities and run cover business and legitimate businesses that can inform the intelligence community of persons they would want to track. NSA personnel in the community usually have cover identities such as social workers, lawyers and business owners. NSA personnel can control the lives of hundreds of thousands of individuals in the US by using the NSA's domestic intelligence network and cover businesses. The operations independently run by them can sometimes go beyond the bounds of law. Long-term control and sabotage of tens of thousands of unwitting citizens by NSA operatives is likely to happen. NSA DOMINT has the ability to assassinate US citizens covertly or run covert psychological control operations to cause subjects to be diagnosed with ill mental health. As of the early 1960s, the most advanced computers in the world were at the NSA, Ft Meade. Research breakthroughs with these computers were kept for the NSA. At the present time the NSA has nanotechnology computers that are 15 years ahead of present computer technology. The NSA obtains blanket coverage of information in the US by using advanced computers that use artificial intelligence to screen all communications, regardless of medium, for key words that should be brought to the attention of NSA agents/cryptologists. These computers monitor all communications at the transmitting and receiving ends. This blanket coverage of the US is a result of the NSA's Signals Intelligence (SIGINT) mission. The NSA's electronic surveillance network is based on a cellular arrangement of devices that can monitor the entire EMF spectrum. This equipment was developed, implemented and kept secret in the same manner as other electronic warfare programs. - Signals Intelligence Remote Computer Tampering. The NSA keeps track of all PCs and other computers sold in the US. This is an integral part of the Domestic Intelligence network. The NSA's EMF equipment can tune in RF emissions from personal computer circuit boards (while filtering out emissions from monitors and power supplies). The RF emission from PC circuit boards contains digital information in the PC. Coded RF waves from the NSA's equipment can resonate PC circuits and change data in the PCs. Thus the NSA can gain wireless modem-style entry into any computer in the country for surveillance or anti-terrorist electronic warfare. A subject's bioelectric field can be remotely detected, so subjects can be monitored anywhere they are. With special EMF equipment NSA cryptologists can remotely read evoked potentials (from EEGs). These can be decoded into a person's brain-states and thoughts. The subject is then perfectly monitored from a distance. NSA personnel can dial up any individual in the country on the Signals Intelligence EMF scanning network and the NSA's computers will then pinpoint and track that person 24 hours a day. The NSA can pick out and track anyone in the US. NSA Signals Intelligence uses EMF Brain Stimulation for Remote Neural Monitoring (RNM) and Electronic Brain Link (EBL). EMF Brain Stimulation has been in development since the MKULTRA program of the early 1950s, which included neurological research into radiation (non-ionizing EMF) and bioelectric research and development. The resulting secret technology is categorized at the National Security Archives as "Radiation Intelligence", defined as "information from unintentionally emanated electromagnetic waves in the environment, not including radioactivity or nuclear detonation". Signals Intelligence implemented and kept this technology secret in the same manner as other electronic warfare programs of the US Government. The NSA monitors available information about this technology and withholds scientific research from the public. There are also international intelligence agreements to keep this technology secret. The NSA has proprietary electronic equipment that analyzes electrical activity in humans from a distance. NSA computer-generated brain mapping can continuously monitor all of the electrical activity in the brain continuously. The NSA records and decodes individual brain maps (of hundreds of thousands of persons) for national security purposes. EMF Brain Stimulation is also secretly used by the military for brain-to-computer link (in military fighter aircraft, for example). For electronic surveillance purposes, electrical activity in the speech center of the brain can be translated into the subject's verbal thoughts. RNM can send encoded signals to the brain's auditory cortex, thus allowing audio communications direct to the brain (bypassing the ears). NSA operatives can use this covertly to debilitate subjects by simulating auditory hallucinations characteristic of paranoid schizophrenia. Without any contact with the subject, Remote Neural Monitoring can map out electrical activity from the visual cortex of a subject's brain and show images from the subject's brain on a video monitor. NSA operatives see what the surveillance subject's eyes are seeing. Visual memory can also be seen. RNM can send images direct to the visual cortex, bypassing the eyes and optic nerves. NSA operatives can use this surreptitiously to put images into a surveillance subject's brain while they are in REM sleep for brain-programming purposes. There has been a Signals Intelligence network in the US since the 1940s. The NSA, Ft Meade has in place a vast two-way wireless RNM system which is used to track subjects and non-invasively monitor audiovisual information in their brains. This is all done with no physical contact with the subject. RNM is the ultimate method of surveillance and domestic intelligence. Speech, 3D sound and subliminal audio can be sent to the auditory cortex of the subject's brain (bypassing the ears), and images can be sent into the visual cortex. RNM can alter a subject's perceptions, moods and motor control. Speech cortex/auditory cortex link has become the ultimate communications system for the intelligence community. RNM allows for a complete audiovisual brain-to-brain link or brain-to-computer link. NSA SIGINT can remotely detect, identify and monitor a person's bioelectric fields. Intelligence has the proprietary ability to monitor remotely and non-invasively information in the human brain by digitally decoding the evoked potentials in the 30-50 Hz, 5 milliwatt electromagnetic emissions from the brain. Neuronal activity in the brain creates a shifting electrical pattern that has a shifting magnetic flux. This magnetic flux puts out a constant 30-50 Hz, 5 milliwatt electromagnetic (EMF)wave. Contained in the electromagnetic emission from the brain are spikes and patterns called "evoked potentials". Every thought, reaction, motor command, auditory event and visual image in the brain has a corresponding "evoked potential" or set of "evoked potentials". The EMF emission from the brain can be decoded into the current thoughts, images and sounds in the subject's brain. EMF Brain Stimulation works by sending a complexly coded and pulsed electromagnetic signal to trigger evoked potentials (events) in the brain, thereby forming sound and visual images in the brain's neural circuits. EMF Brain Stimulation can also change a person's brain-states and affect motor control. Two-way electronic Brain Link is done by remotely monitoring neural audiovisual information while transmitting sound to the auditory cortex (bypassing the ears) and transmitting faint images to the visual cortex (bypassing the optic nerves and eyes). The images appear as floating 2D screens in the brain. Two-way electronic Brain Link has become the ultimate communications system for CIA/NSA personnel. Remote neural monitoring (RNM, remotely monitoring bioelectric information in the human brain) has become the ultimate surveillance system. It is used by a limited number of agents in the US Intelligence Community. This modulated information can be put into the brain at varying intensities from subliminal to perceptible. Each person's brain has a unique set of bioelectric resonance/ entrainment frequencies. Sending audio information to a person's brain at the frequency of another person's auditory cortex would result in that audio information not being perceived. The Plaintiff learned of RNM by being in two-way RNM contact with the Kinnecome group at the NSA, Ft Meade. They used RNM 3D sound direct to the brain to harass the Plaintiff from 10/90 to 5/91. As of 5/91 they have had two-way RNM communications with the Plaintiff and have used RNM to attempt to incapacitate the Plaintiff and hinder the Plaintiff from going to the authorities about their activities against the Plaintiff in the last 12 years. The Kinnecome group has about 100 persons working 24 hour a day at Ft Meade. They have also brain-tapped persons the Plaintiff is in contact with to keep the Plaintiff isolated. This is the first time ever that a private citizen has been harassed with RNM and has been able to bring a lawsuit against NSA personnel misusing this intelligence operations method. Remote monitoring/tracking of individuals in any location inside any building, continuously, anywhere in the country. A system for inexpensive implementation of these operation allows for thousands of persons in every community to be spied on constantly by the NSA. 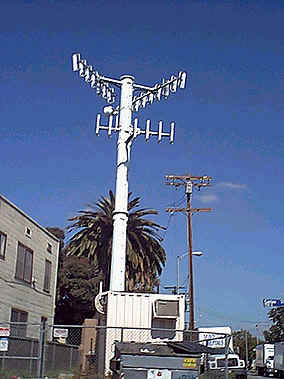 The GWEN (Ground Wave Emergecy Network) system was ceremoniously and publically decommissioned in 1999, following years of public turmoil and demonstration against the placing of the towers near populated areas. According to the military, it was solely designed for emergency communications during nuclear attack, and was replaced with SCAMP, a mobile system that was harder to target. This was all of course, the party line so to speak. It has been speculated as of late, that the equipment (which was left operable and intact after the decommissioning), was to be used for other purposes at a later date once the public hue and cry died down. We believe we have found the purpose. 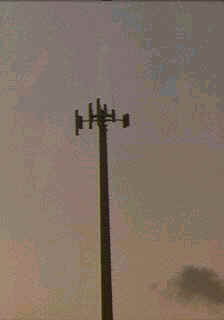 The equipment was designed to repeat ultra low, very low and low signals in hexagonal transmission cells, much in the same way telephone cell towers provide cellular service areas. The 200+ sites were spaced so that these cells covered the entire US, providing a "dome" of frequency over the nation. As of yesterday HAARP began broadcasting the most powerful signal strength ever publically recorded, without any reduction in strength, around the clock. At 3.39 megahertz, the signal is well within the range of the GWEN repeater systems rebroadcast capability. It was further indicated that a potential change in the concentrated broadcast direction fr om HAARP (one every minute), could be detected. If this is true, then it is conceivable that the signal is being randomly rotated into each GWEN site on the repeater grid for one minute, in an effort to eliminate jamming, and make public confirmation of the process very hard. You would literaly have to put a point-to-point device between each tower and HAARP to prove that HAARP was where the signal was being introduced into the grid from. However, for the purpose of scientific confirmation, a simple field strength test on 3.39mhz around the tower, would show that it is in use on that frequency, nd go a long way to proving this speculation is correct. This brings up many different questions, three which we consider are the most important. 1. Is Star Wars already in place and operable NOW as a National Defense System using GWEN? 2. OR, is even this application a red herring to keep our eyes off of the true use of the system? There is a mass of evidence in hand concerning low frequency mind control experiments by the military. Were HAARP and GWEN were really designed as a nation blanketing mind control system, which is now ready to be used? If so, all of the in-fighting for the presidency would finally make sense. He who won, would be the first to control the system, and if successful, the populace of the US. "The large black top of the Federal Building in San Francisco looks like a giant air-conditioning vent, 50 feet tall, comprising the entire top of the building. It is actually a radar, microwave, and radio transparent shield for an array of communications devices on the roof of the building. Such "blinds" on top of government buildings are nothing unusual, it isn't necessary to visually remind everybody that such buildings also are likenesses of Orwell's Ministry of Information (read, CIA). And as such are in need of systems of communications independent of civilian mediums. Which, anyway, would be purposely interrupted in any serious case of civil unrest. "It is important to note three facts at this point, the purpose of which will come clear in the end: First, the Federal building is located at the base of a broad hill. It is on the low rise of this hill where San Francisco's 'Skid Row' district, the 'Tenderloin,' uneasily rests. And so the Federal Building can be seen from virtually any place in the Tenderloin. And let us reverse this thought: virtually any place in the Tenderloin may be seen from the Federal Building. And it is this unimpeded view whichbrings to mind the second oddly coinciding factor; that Low Frequency Electromagnetic emissions like television broadcasts will not pass through earth (hills, or the horizon), nor do they even pass very well through buildings, and so require a fairly clear shot, unlike higher frequency emissions like radio. This is why you have to put TV antennas on the roof. "Now with these three things in mind, consider this fourth. Since I have had the fortune to live for three years in this ring of hell, the Tenderloin, I have noticed something very odd. At least 15 times I have noticed in the morning or early evening a pronounced buzzing or humming. Very low and hard to hear. Something like the sound which some can hear of a TV that is on in a room, but with the volume off. And on looking for the source of this sound, I found that it seemed to come from everywhere and nowhere. In other words it seemed to be coming from inside my head. I do not mean this figuratively. I mean that my head seemed to resonate with the vibration. And I felt that my thoughts were disrupted. The buzzing seemed to make thoughts fall apart just before forming, like sand on a vibrating metal plate, and I felt vaguely angry. On the third or fourth occurrence of this, I noticed that in the wake of the buzzing sound, an unusual number of fights could be heard breaking out all around me. From out on the streets, and from adjoining buildings, and apartments, came the shouts and threats of people overcome with anger. And I thought, though at first it seemed horrible to consider, 'Hadn't ELF subjects reported the feeling or sound of buzzing in their heads?' and 'what better section of the population could be chosen on which to conduct ELF experiments.' A large percentage of inner urban dwellers are already so close to the edge that he or she is highly likely to express any fluctuation of mood with a corresponding fluctuation of activity which might come to the attention of the police. In a neighbourhood where aberrant behaviour is common and expected, slight increases of such behaviour would go completely unnoticed, but would be detectable by careful observation of incoming reports to the police department. It would be unlikely in the extreme that anyone would associate the strange buzzing sound with unaccountable accompanying emotional swings. Impossible that someone would suspect secret agents of systematically barraging the politically powerless with mood and consciousness ELF waves from atop the Federal Building. But even if such an impossibility came to pass, and allegations were made, would they not automatically be discredited by the general perception of the poor (i.e. Tenderloin inhabitants) as mentally unstable, alcoholic, drug addicted, and of the government as an essentially well meaning parent, who would not really ever purposely harm her children? "Tests of ELF effects could be precisely monitored by the existing police department recording system (at no extra cost), all recorded on the justice system's networked national computer system, containing exact times of complaints, record of outcome, location, identity, profile, and criminal history of all persons involved. Police department ignorance of the tests would actually be desirable. The entire operation could be run by as few as two people. ELF broadcast times would simply be correlated with any flux of reports to the police department. And the exact nature of the ELF effects on human emotion would be conveniently built into the data received from police reports. For example, an increase of domestic violence at 4%, and suicides 2%, perhaps one or two extra stabbings during your special hour-long broadcast of the latest ELF 'Top Ten'. A decrease in premeditated crimes might indicate a breakdown of thought process during the time of ELF transmission. Do you see? A double blind experiment (neither police nor populace have any idea) on a perfectly contained and monitored large population control subjects, in a typical city, with an 'in place' monitoring system (police reports) with a plus or minus accuracy allowance of virtually 0% since the experiment can be performed an unlimited number of times over a period of years. Could such malignant experiments be pulled off in any other setting? If your aim were to induce murders, violence, psychosis, severe depression, or suicide, you couldn't really go calling on John Hopkins University now, could you? Anyway, the very point of such a thing would be its use on urban populations. Listen, you have a little country somewhere, you destabilise the populace with ELFs and conventional means and overwhelm the local law enforcement agencies, martial law is declared, the democratically elected government falls. You install a corrupt dictator. You say to the American people, 'We must send humanitarian aid.' A hundred million dollars is allocated to the small country. The corrupt dictator steals the goods and money, and deposits the laundered free and clear taxpayer dollars in an offshore American bank. Beginning to get the picture? Think of how perfectly foolproof this is, how elegant, how appealing, how logical, how insidious, how horrible, how possible, and all it costs is the suffering of thousands of people. The link between Haarp and the chemtrails trails. Here is a list of the GWEN new sites. The Earth is wrapped in a donut shaped magnetic field. 1000, 1 Mhz =1 million. A 1 Hertz wave is 186,000 miles long, 10 Hz is 18,600 miles. wave energy for very long distances through the ground. second. There are 5 atmospheric rivers in each Hemisphere. the psychic 8 Hz brainwave and attract psi phenomena. head.' This was placed under caps or lodged in the jaw. mind. Basically to fog the difference between the real and unreal. England, cleverly disguised as cell phone towers and trees? Resonance, inching us towards the 4th dimension? correct Tesla-wave pattern to create voices within the victim. then superimposed on the pulse modulated microwave beam." are unique and they can remotely track someone in public. Maxwell discovered electromagnetic waves have 3 components. wave that resonates between the earth and the ionosphere. storehouse of knowledge here since the beginning of time. instant miracles, knitting broken bones and removing arthritis. antenna on the AF Base.."
This was forwarded to me. See what your research digs up, if you're interested. Otherwise delete. You might want to read clear to the bottom, though. have the ability to trigger climate change. HAARP home page at http://www.haarp.alaska.edu/). 8. Quoted in Begich and Manning, op cit.